redBus.in is one of the leading website for bus ticket and hotel booking. You can now get flat 50% discount on hotel bookings and save up to Rs.2250 for all the hotel bookings booked through redBus via PayUmoney. You can get flat 50% discount by using the coupon code 'REDHOT50'. Maximum discount is Rs.2250. 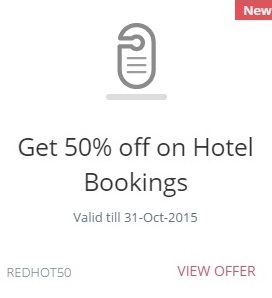 How to avail Redbus Hotels Flat 50% off Coupon code Offer? 1. Visit RedBus offer page here. 2. Click on Hotels tab. 3. Browse the available hotels for your desired date and other inputs and select the hotel. 4. Login or enter your details. 5. Apply Promo Code 'REDHOT50' to get 50% off up to Rs.2250. 1. You can get flat 50% off (upto a max. of Rs. 2250) on all hotel bookings. 3. Red Bus Offer code 'REDHOT50' has to be used. 4. Offer is applicable only on bookings through www.redbus.in. 5. This offer cannot be clubbed with any other offer. 7. Offer is not valid for travel agents.